This has become my go-to smoothie recipe of late, give or take an ingredient or two. It’s perfect for breakfast of after a grueling workout. For anyone looking to get more protein into their diet in a form that’s easy for the body to assimilate and absorb, this smoothie is for you. I tagged this smoothie with the “superfood” label because it calls for spirulina. A single-celled, blue-green spiral algae that gets its green color from chlorophyll, spirulina is best known in health circles for its protein content. At around 65-70% pure protein by dry weight, it’s a legitimate protein powerhouse. Protein that’s easy for the body to assimilate and use, mind you. Spirulina is available in tablets and crunchies, but the powdered form works best in smoothies. Besides being a superb source of protein, it’s rich in vitamins A (beta-carotene), B1, B2, B6, E, and K, and helps balance brain chemistry, build healthy blood, boost the immune system, and is a potent antioxidant. The other ingredient that elevates this smoothie into the “protein power” category is your protein supplement of choice. There are many good ones on the market. Here are the best I’ve tried and recommend. Please do your research before using any old off the shelf protein powder as many contain undesirable fillers and chemicals. 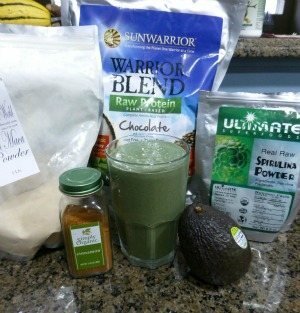 My favorite protein is Sun Warrior, click here for my full review. If you aren’t in need of as much protein as this recipe calls for, simply omit the protein powder and enjoy a good old superfood smoothie. I’ve been thriving on raw goat milk lately, which is what I made this smoothie with. If you don’t have access to raw milk or are a vegan, use almond, coconut, or hemp milk. Enjoy! Place all of the ingredients into your high speed blender and blend for around 30-45 seconds or until your desired consistency is reached. I’d love to hear what you think of this protein power superfood smoothie in the comments below. Happy Blending! Nice to hear you loved this smoothie, Lauren :) It’s one of my favs. I had weight loss surgery 5 years ago & lost 9 stone which brought me down to 11 St. I was happy at that for a few years but this past year has seen me gain a stone, mainly due to medication making me hungrier than normal, so I’m looking at protein smoothie’s as a solution to both weight loss & getting enough protein into me. First I’ve heard of Precision Engineering Whey protein from Holland & Barret. I perused their site, but couldn’t find any info on why they recommend consuming within 20 minutes. I’d reach out to them and pose that question. Most protein powders are fine for several hours after mixing and I’m guessing this one is too.